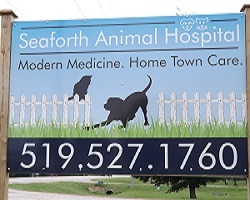 We have been providing comprehensive healthcare services to pets in Seaforth, Ontario and the surrounding areas of Huron and Perth Counties for over 30 years. We've got what you need to keep your pet happy and healthy! We offer a range of convenient appointment times, including some evening and Saturday appointments, along with pet grooming, supplies and pet food. 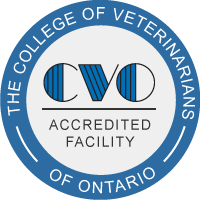 Our full service veterinary hospital is well equipped with advanced equipment and technologies to provide the highest standard of care for your pet. Our facility has the equipment to provide comprehensive in house testing for accurate diagnosis, dental and full-body x-ray, therapeutic laser, surgical suite, dental suite, pharmacy, and more. Please browse our website to learn more about our caring team of pet care professionals. Read information in our Pet Library, view videos, take a virtual tour of our veterinary hospital, read testimonials, and find details about upcoming events. Call our office today for all your pet's health care needs!